Are you a citizen of the United States who lives abroad? You probably know that the U.S.A. is one of only two countries that applies citizenship based taxation in order to tax its own citizens on their worldwide income, irrespective of where they live or work anywhere in the world. If you're thinking about becoming a digital nomad or expatriating to another country, do you know how to avoid having to pay tax on your income while abroad? There could be huge penalties or tax evasion charges if you don't file correctly. Fortunately, these important questions have answers. By combining the right strategies for citizenship, residency, banking, incorporation, and physical presence in other countries, most people who work overseas can legally lower their U.S. tax owing to $0. 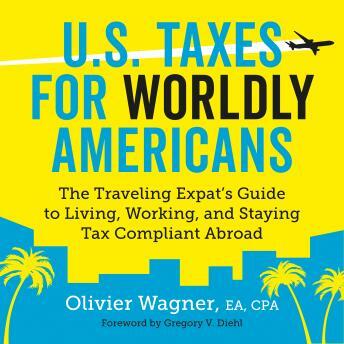 In U.S. Taxes for Worldly Americans, Certified Public Accountant, U.S. immigrant, expat, and perpetual traveler Olivier Wagner preaches the philosophy of being a worldly American. He uses his expertise to show you how to use 100% legal strategies (beyond traditionally maligned âtax havensâ) to keep your income and assets safe from the IRS. -Step-by-step instructions to fill out the Forms and Schedules you will use to file your offshore tax, no matter where you are. -How to qualify for special deductions, credits, and exemptions on international taxation. -Why opening bank accounts and corporations in foreign countries is easier than you think. -How residency or citizenship in another country can legally lower your taxes. -Practical advice for moving, living, and working with tax free income in other parts of the world. -What to consider before renouncing your American citizenship and saying goodbye to the IRS for good. As a non-resident American, there is no single easy answer to lower your taxes. If you don't understand every possibility, you could end up paying too much. Embrace a worldly lifestyle with confidence as you master the U.S. tax system for Americans living overseas.